Industry Experts unveiled an updated 2017 version of the global market research report on Xylitol, a polyol/sugar alcohol sweetener. The new report ‘Xylitol – A Global Market Overview’, reveals that the chewing gum remains the leading consumer of xylitol through to 2022 with 67% while personal care products stands second with about 9% consumption in the same year. Xylitol is widely used in sugar-free chewing gums, though, it is mostly combined with sorbitol to lower the production costs. The cost of xylitol might come down to allow manufacturers to use xylitol alone in these applications as the new sources and processes are in development for xylitol production, such as low-cost microbial fermentation methods and xylitol production from sugarcane bagasse. Combined by the above reason and xylitol”s dental health benefits, xylitol demand is expected to grow in chewing gum applications in the years to come. Main growth driver for xylitol, is the growing number of diabetes people around the globe. Number of studies reveals that intake of high caloric sweeteners may increase the risk of obesity and leads to diabetes. Attributed this reason, low-calorie sweeteners usage is expected to increase in specific foods targeted at diabetic people and also at consumers concerning over their weight. 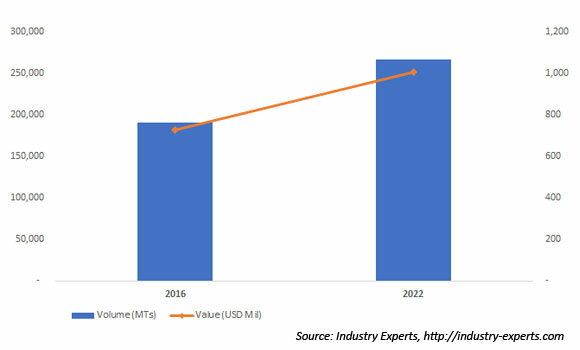 Moreover, xylitol market is expected to grow above the average CAGR as it expands its usage in chewing gum and other applications, where it benefits from a unique profile in adding sweetness, enhancing minty flavors and actually improving dental health apart from being a low-calorie sweetener. This global report analyzes the key end-use sectors of xylitol including Chewing Gum, Confectionary, Other Food & Beverages, Personal Care and Others (Pharmaceuticals and nutraceuticals). The global markets for the above-mentioned end-use sectors are analyzed in terms of volume in metric tons and value in USD for 2014-2022 analysis period. Driven by increasingly health and weight conscious consumers, xylitol demand is expected to grow in sugar-free and low-calorie food products. Global market for xylitol is estimated at 190.9 thousand metric tons, valued at US$725.9 million in 2016 and expected to reach 266.5 thousand metric tons valued at just above US$1 billion by 2022, by growing at robust CAGRs of around 5.7% in terms of both volume and value. The global market for xylitol is segmented into four major regions namely, North America, Europe, Asia-Pacific and Rest of World. The regional markets further analyzed for 15 more independent countries across North America – United States, Canada and Mexico; Europe – France, Finland, Germany, Italy, Russia, Spain and the United Kingdom; Asia-Pacific – Australia, China, India, Japan and South Korea. The market is analyzed in all of these major regions by key countries and by major end-use sectors in terms of both volume and value. This 258 page Xylitol market report includes 157 charts (includes a data table and graphical representation for each chart), supported with meaningful and easy to understand graphical presentation, of market numbers. This report profiles 17 key global players. The research also provides the listing of the companies engaged in R&D, manufacturing and supply of xylitol. The global list of companies covers the address, contact numbers and the website addresses of 52 companies.